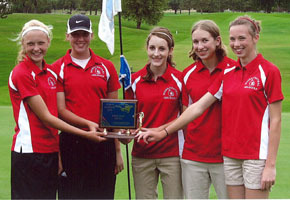 In the tightest finish of the 2009 season to date, the Boone Central girls golf team added the Wayne Invitational championship to its list of accomplishments Thursday, Sept. 24. The Cardinals were pressured by Columbus Scotus, but edged the Shamrocks 377-380 behind their strong trio at the top of the line-up. Junior Brooke Bolin (80) and freshman Amy Ahlers (84) led the way for Boone Central, once again finishing 1-2 in the individual standings. Sophomore Britany Seda gave the Cards a third top ten golfer, placing seventh (92). Senior Kayla Kettelson (121) rounded out the BC team score, just low enough to hold off Scotus, which had four golfers score between 86-105, including third-place individual Jacy Gasper and fifth-place Nicole Gasper. Crofton’s Molly Zavadil was fourth individually and the Warriors finished third in the team standings (390).